fold over the top right hand corner of the first page, so that the edges are aligned. Repeat for every page. 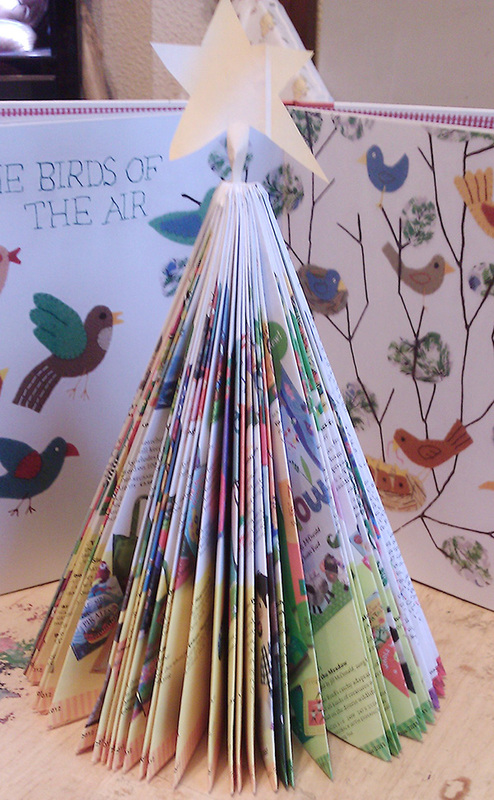 When you get to the last page, you can fold and tuck it around the first to help keep your tree together. Hey Mahala! It’s Deonna from the Child at Heart blog! Thank you so much for linking up at the Merriest Blog Hop! I can’t wait to see all of your holiday ideas…these trees are so cute. I already have SO many catalogs and was about to throw them out. I might have to go get those and try this. I love all things paper crafts so this is right up my alley! Just stopping by to say thanks for linking up at The Merriest Blog Hop! This post was great. What a creative way to reuse all that paper 🙂 I hope we’ll see you again for the next party!